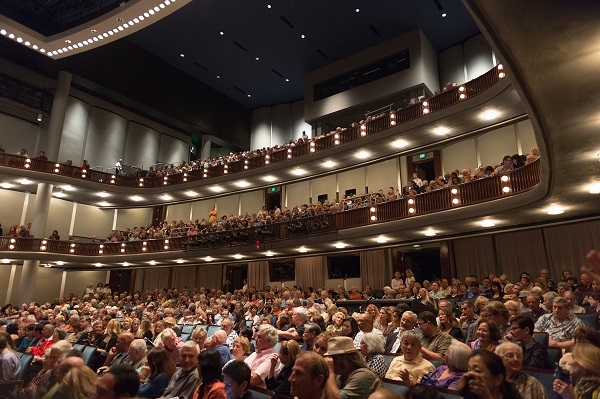 The 1,200-seat Castle Theater is the Center's principal performance space; its multitiered configuration places no seat farther than 90 feet from the stage. Designed for a wide range of productions, Castle Theater features a 50'x 90' stage with orchestra pit and shell, sprung-wood dance floor, and advanced lighting and sound systems. There are approximately 1,200 seats in the Castle Theater. There are 3 seating levels: Orchestra, Mezzanine, and Balcony. Orchestra level has 682 seats plus 11 wheelchair spaces. Certain seats can be removed to accommodate additional disability needs or production-related requirements. The Mezzanine level has 262 total seats, comprised of 18 box seats, 26 loge seats, and 218 general seats. The projection booth is located at the back of the Mezzanine, so if projection is being used for a show, approximately 60 seats in the center need to be blocked off. The Balcony has 290 seats, including 4 wheelchair and 4 wheelchair companion seats. There are 10 box seats, 26 loge seats, and 254 general seats. Standing room of up to 60 can fit behind the last row. If the four rows on the orchestra pit are removed, it subtracts 72 seats. The house opens 30 minutes prior to show time. All set-up and sound checks must be completed by this time. The Center's technical director, or his designated stage manager, will assist the visiting company in opening the house on time. Under no circumstance will the performance begin, or the intermission end without the express direct verbal approval from the Center's technical director, or designated stage manager. 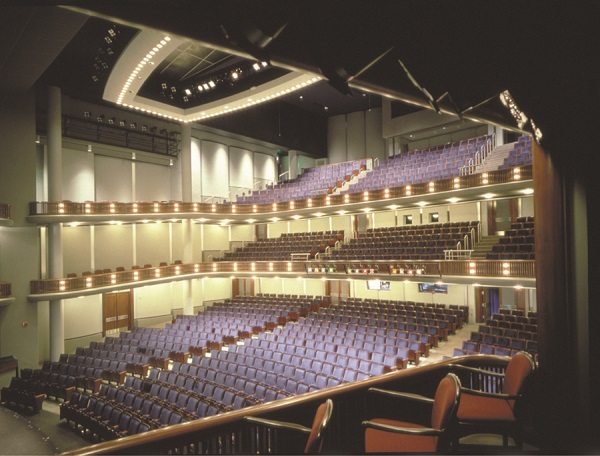 Seats may be removed from the front of house mix position or the orchestra pit as needed; all such requests must be approved by the Center's technical director before tickets go on sale. The management reserves the right to control audio volume and equalization for any show at the Center. Use of pyrotechnics or open flames must be preapproved by both the Center's technical director and the County of Maui Fire Prevention Bureau. Due to fire regulations, the fire curtain must not be obstructed in any manner which could prevent its deployment or complete direct contact with the stage floor. All scenery, props, stage dressing, costumes, and all other flammable material must be flame-proof. No nails, tacks, stage screws, tape or similar articles shall be driven or placed in any part of the premises without the approval of the Center's technical director. There is no smoking allowed in any part of the Castle Theater at any time. No rigging or other equipment can be used or changed without the prior knowledge and approval of the technical director. Set pieces, props, and other wooden objects must be termite- & insect-free. A professional inspection and/or certification may be required. Estimates of technical charges are available by contacting the technical director. This estimate will include stage labor and equipment charges only. The Castle Theater stage has a sprung floor for dance. A subfloor is covered with 1 and1/4" tongue & grooved southern yellow pine seated over neoprene pads. The stage is routinely painted flat black. Marley dance flooring is available for those requiring it. No nails, screws, staples, or even tape should be applied to the stage floor without approval from the technical director. Sharp objects require padding to protect the soft wood of the floor. Cellos and upright bass instruments should have a floor protector under the endpin. Located directly behind the theater, the loading dock is 49" above ground level, and can accommodate two trailers (or containers) simultaneously. There is direct & level access to the theater through 14'H x 9'4"W doors. Dock levelers are available for minimal dock height discrepancies. Receiving area enters theater at upstage right wing. A forklift is available. There are 7 dressing rooms available at stage level—1 star dressing room with private bathroom and shower and 4 principal dressing rooms that have a sink and closet shelving. Four people fit comfortably in these principal rooms. There are two large chorus dressing rooms that can accommodate larger groups. They are usually separated for men and women, but pocket sliding doors can be opened to transform it into one large room. Each chorus room has a full bathroom with shower stalls. Each dressing room has audio production monitors with paging override, Clear-Com capability, locking doors, full-length mirrors, and vanity mirrors with multibulb lighting. There is a laundry room with a washer, dryer, and a deep sink. Ironing boards, irons, and a professional-grade steamer is available. There is a centrally located green room backstage with a kitchen/pantry attached. The small kitchen has cabinets, sink, refrigerator, and microwave but no cooking stove. The Maui Arts & Cultural Center is a nonunion facility. The Center’s Tech Department has trained full-time staff and augments show labor requirements by utilizing on-call tech help available from a pool of qualified, trained, hourly employees who are familiar with our equipment and facility. All labor arrangements are made through the technical director. All work performed by stage hands is at the user's expense. Some or all of these personnel are required whenever the theater is reserved regardless of any union or other personnel required by the renter.